The Beatles are invading America again. Or at least they are invading my mind. The past few weeks have been filled with Beatlemania. The original Fab Four were seemingly on every page of newspapers and magazines like they were fifty years ago. They even invaded my two Sunday crossword puzzles. 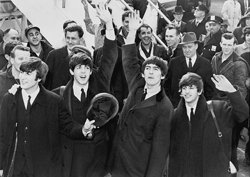 It was nostalgic for those who were crazed teenagers back in sixties when The Beatles first invaded America. But for me, it was like I found a new music group. Do not get me wrong. I have heard The Beatles since I was a kid, but for the past few weeks I have heard The Beatles morning, noon, and night. And I have not even had the radio on. I just keep hearing Birthday, Back in the U.S.S.R., A Hard Day’s Night, and other songs over and over and over again. Just in my head. So much so that when I was at the library, I found a book with The Beatles’s songs so that I could learn to play a few. Hopefully, to stop them from playing all the time. I know it sounds counterintuitive, but I figured that if I learned how to play a few songs, I could go back to not having a hard day’s night all the time. That every day would not be my birthday. That I would no longer want to go (for the first or second time) back to a country that no longer exists. I figured that if I put a few Beatles’s songs in my repertoire, I might get them out of my head. So far, learning to play a few songs has not stopped the music. I still hear chords and riffs and lyrics. Not like I play them, but like they were played by The Beatles. Still, even though my ploy has not worked, I hope to have a normal playlist in my head someday soon. It is not that I really need to get The Beatles out of my head. I like them as much as the next guy. Certainly not as much as those who were crazed teenage girls back when I was just a few months old, but as much as most ordinary folks. Which is why I need to get them out of my head. I am just a normal person when it comes to liking The Beatles. Fortunately, the fiftieth anniversary of The Beatles originally appearing on The Ed Sullivan Show only comes once. So eventually, I will not have their songs in my head all the time. After all, the anniversary hoopla, which has lasted for at least a month, will eventually end. When it comes right down to it, I suppose a month of celebrating the anniversary is not nearly as long as all the hoopla lasted when The Beatles first invaded America. I was not old enough to hear that The Beatles had landed or to understand what their invasion meant to the music and cultural scene. I did not need to endure or get to enjoy (depending on your perspective) the many months or even years of Beatlemania. Which means that I do not get to look back with nostalgia. But like I said in the beginning, I do get to enjoy The Beatles like a new music group. And I get to enjoy the music non-stop. I cannot stop the music no matter what I do. Maybe it is because of all the hoopla surrounding the fiftieth anniversary or maybe it is because the music is still relevant and popular today. Either way, the non-stop music is okay. When all is said and done, I am sure I can withstand the invasion of The Beatles.